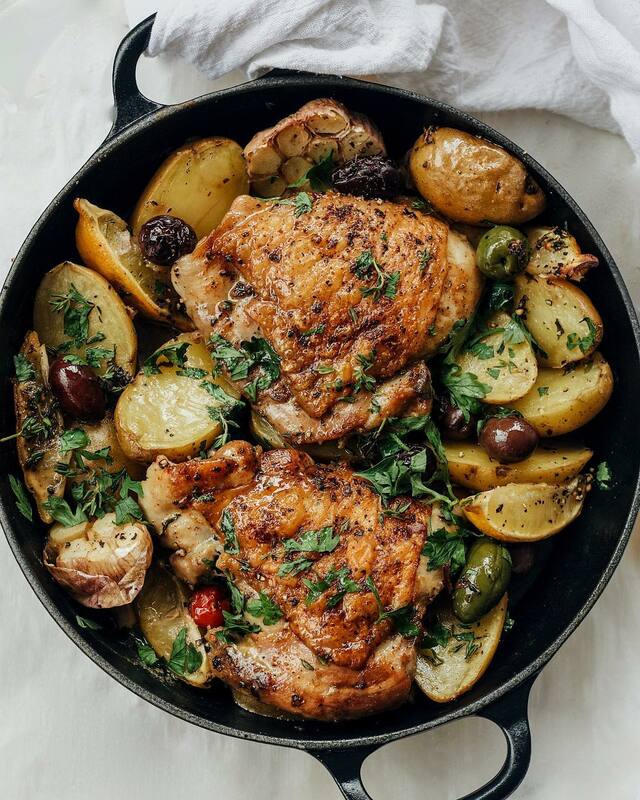 White Wine & Herb Roasted Chicken with Lemon, Garlic, Baby Dutch Potatoes and Olives. The rain is pouring...we needed comfort food. This recipe is featured in our Weekly Meal Planner here! Heat a cast iron skillet over medium heat and add a bit of olive oil. Heat until shimmering, then add chicken skin side down and cook until golden. You want the pan hotter than you think - to render all that fat and make the skin super crispy. Don't move it until you're certain it has had enough time or it may stick. Turn chicken over to crisp on the other side, then remove from pan and set aside. Add the wine to the pan you cooked the chicken in to deglaze, scrap up any brown bits that have formed on the bottom. Add the potatoes, garlic, lemon, herbs, olives and spices and stir to combine. Add the chicken (skin side up) and nestle it into the pan. Roast chicken and potatoes in the oven for 35-40 minutes or until juices run clear. Add extra fresh herbs, and squeeze the roasted garlic out of the skin and combine it with the pan juices before serving.